PIQUA — Jim and Brenda Scott Vetter celebrated their 50th wedding anniversary on Dece. 28, 2018. They were married in 1968, in Piqua, at the former Evangelical United Brethern Church. The ceremony was officiated by Brenda’s grandfather, the Rev. Arthur Ferris Koons, and the pastor, the Rev. Carl Hahn, Jr.
Brenda’s best friend from high school, Susan Foster (later Lightcap), was the maid of honor. Jim’s brother, John Vetter, was the best man. Brenda’s parents are Fred and Lois Koons Scott of Piqua, and Jim’s parents are the late Lester and Virginia Campbell Vetter, also of Piqua. Sherry Scott (later Schaefer), Brenda’s sister, was the junior bridesmaid and the groomsman was Jim’s best friend, Ron Grote. The couple resided in Westerville, Ohio, where they both attended Otterbein College. Later, they were houseparents at the Methodist Children’s Home in Worthington, Ohio. Brenda worked many years in the music field, with a piano studio and as an accompanist for Piqua City Schools. Jim, who graduated in 1972 from Otterbein, worked 42 years in in various Human Services agencies. They have one son, Joshua Scott Vetter, who now resides in the Columbus area. They also raised five German Shepherd dogs over the years. 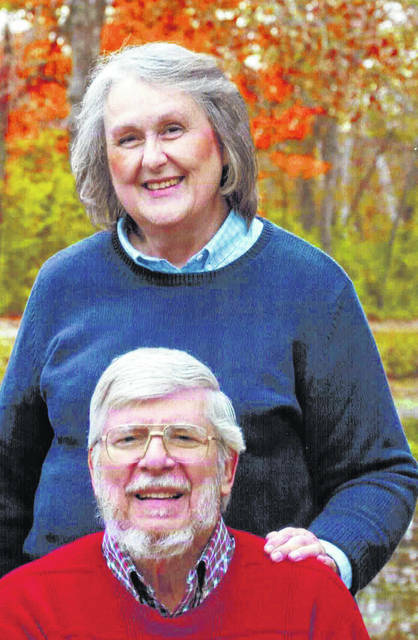 In retirement, Brenda still works as a church accompanist and Jim is the captain of the General Harrison canal boat at the John Johnston Farm and Indian Agency. He also works at the Piqua YMCA. Jim plays in the Gotham City Brass Quintet and the Piqua Civic Band. He and Brenda both play in the Sidney and Troy civic bands. They are founding members of The New Renaissance Singers, an a cappella singing group. The Vetters will celebrate in the spring with family and friends.